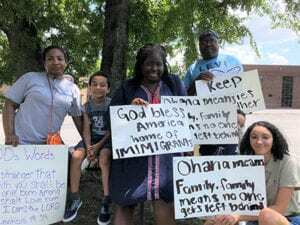 NASHVILLE, TN — Separating children from parents is intolerable for many Americans who protested Donald Trump’s immigration policies Saturday. However, Trump’s recent order changing the separation policy was noted. 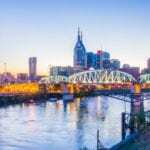 Demonstrations in many other cities had a combined participation estimated by the Associated Press at “hundreds of thousands.” Nashville’s crowd, ranging from 1,000 to several thousand, marched from Fannie Mae Dees Park to Belmont University. 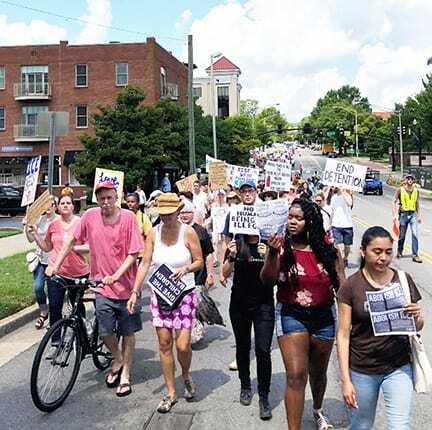 Nashville Peace and Justice Center Board member Susan Shann said, “We’re protesting at Belmont because of … cruel practices” including family detention and separation at the Mexican border. Demonstrators protested Damon Heninger, CEO of Nashville-based CoreCivic which manages government prisons. Heninger’s on Belmont’s board of trust. “That’s the connection to Nashville. That’s why were at Belmont,” said retired woodworker Dan Andrew. CoreCivic is contracted to hold immigrants crossing the Mexican border. CoreCivic holds children together with parents, according to CoreCivic as quoted in a Gannett report. Tseffos said Belmont should remove Heninger from its board. Groups organizing Nashville’s march included the ACLU, Women’s March and Democratic Socialists of America. Clare Bratten and Clint Confehr collaborated for this story.